Due to late winter conditions, water availability within Lakeside and Hicks Lake Campgrounds is limited to the manual hand-pump in each campground at this time. A boil water advisory is in place in Hicks Lake Campground until further notice. Located north of Harrison Hot Springs, Sasquatch Provincial Park is characterized by a series of pocket lakes, a unique second-growth and birch forest, and scenic mountain ridges. Hicks and Deer Lakes are ideal for motor-boating and canoeing, while Trout Lake provides a tranquil fishing experience. Visitors can also enjoy camping, hiking, wildlife viewing, and picnicking. Campers and swimmers should be aware that swimmer's itch may be present in Deer Lake and Hicks Lake. For more information on the treatment and prevention of swimmers itch, check out the BC Healthfiles page. Quiet Hours are 10 pm to 7 am: Music, generators, etc. must be shut off completely between these hours. ATVs and other off road vehicles (including those registered under the ORV Act) are not permitted within the park. There is no overnight parking at Green Point. All vehicles will be towed. Sasquatch Park is located off of Highway 7, six kilometres north of Harrison Hot Springs. Follow the signs through Harrison Hot Springs and Green Point. History: The park was originally created by Order-in-Council in 1959 and encompassed twenty hectares on the east side of Harrison Lake, a freshwater inland fjord. At this time, the park was named Green Point Park. In 1960, a picnic site was developed at the lakefront. The site included picnic tables, toilets, changehouses, a pressurized water system, a boat launch, and parking for two hundred cars. The adjacent lands containing Hicks, Deer, and Trout Lakes were added in 1968 and the park was renamed Sasquatch Park after the legendary Bigfoot, who is alleged to have roamed the area. Wildlife: The diversity of habitats at Sasquatch Park supports a large variety of wildlife species including beaver, mountain goat, woodpeckers, warblers, and vireos. Several rare species have been observed in the park, including the bald eagle, tailed frog, and black petaltail dragonfly. The lakes and streams in the park provide excellent fish habitat for over ten species of fish from the sturgeon, smelt, salmon, catfish, and stickleback families. Canoeing is welcome at this park. There are paddle sport services available at Hicks Lake during the summer months, view the Park Operator’s Web Page for information and rates. There is no canoe/kayak specific camping available. There is freshwater fishing for rainbow trout, cutthroat trout and brook char. Anyone fishing or angling in British Columbia must have an appropriate licence. Sasquatch Park has two easy hiking trails and one interpretive trail. The Hicks Lake Trail is approximately 4 km return with an estimated time of 1 1/2 hours. The Deer Lake Trail, which does not go all around the lake, is approximately 2 km return. The Beaver Pond Interpretive Trail is approximately a 500 metre loop. Pets/domestic animals are permitted to be off-leash only when they are swimming. In the Green Point day-use area on either side of the boat launch, but only 200 metres from the boat launch on the right side (northside). Also at Hicks Lake on the left side (eastside) of the boat launch and Deer Lake on the right side (southside) of the boat launch. Otherwise pets/domestic animals must be on a leash at all times and are not allowed in park buildings. You are responsible for their behaviour and must dispose of their excrement. Backcountry areas are not suitable for dogs or other pets due to wildlife issues and the potential for problems with bears. Swimming areas are provided at a few areas in the park. Buoys mark off swimming areas. Deer and Hicks Lake are relatively warm during the summer but Harrison Lake can be cool. 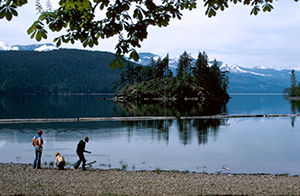 Hicks lake and Deer Lake have sandy beaches, while Harrison Lake has a rocky beach. High winds can come up quickly on Harrison Lake. Swimmer's itch may be present at Deer Lake and Hicks Lake. To prevent swimmers itch, check out the BC Healthfiles page. There are no lifeguards on duty at provincial parks. There are two paved boat launches in the park – at Hicks Lake and Green Point day-use areas. There is a gravel boat launch at Deer Lake. All boat launches are single wide. Deer Lake has a car top launch and only electric motors are permitted. Hicks Lake allows motors with a maximum of 10 horsepower. Trout Lake does not permit motor boats. Harrison Lake does not have motor restrictions. Waterskiing and windsurfing are only available on Harrison Lake. The Hicks Lake boat launch is open all year. There is day-use parking only, no overnight parking is available. Boats can be left in water or beached overnight at the owners own risk. There is a marina nearby to moor boats overnight. There are Dead Slow speed restrictions near the boat launches and swimming areas. Campfires are permitted in the provided fire rings only. Fire restrictions may be in place during times of high forest fire ratings. No campfires are permitted in the day-use areas. There are day-use/picnicking areas in Hicks Lake and Lakeside (Deer Lake) campgrounds. The Green Point day-use area has picnic tables and a parking area. There are grassy areas at both the Green Point day-use on Harrison Lake and the Hicks Lake day-use areas. The beaches are sandy at Hicks Lake and Deer Lake, and rocky at the Green Point area. There are barbeque attachments on the picnic tables. Bring your own barbeque and briquettes. There are no fire pits and open fires are not permitted in the day-use area. There is a beach area open to off-leash dogs near the boat launch areas. The Deer Lake campground has a playground on the beach. The day-use areas are accessible by foot if the gate is locked. The nearest stores are at Harrison Hot Springs. There are pit toilets throughout the campgrounds and park. Flush toilets are available at the Green Point day-use area which also has electrical outlets for hair dryers, etc. The adventure playground is located in Lakeside (Deer Lake) campground. There is a grassy area. No horseshoe pitches or sand boxes available. A sani-station/dump is available during the collecting season. It is located on the main park road between Trout Lake and turnoff to Hicks Lake Campground. There are three campgrounds at this park – Hicks Lake campground, Bench campground and Lakeside (Deer Lake) campground. There are no pull-through or double sites available. Campsites have tent pads and located amongst the trees. There is no parking available for extra vehicles; the maximum is 2 vehicles per site. There is no gate house and the gate is not locked during the camping season. If there is no staff to help you locate a site, check the reservation board (located at the entrance of each campground), then find a campsite with no ticket number on the post. Park staff will come by to collect camping fees. Walk-in camping is not permitted if the gate is locked. The closest store is in Harrison Hot Springs approximately 6 kilometres away. There is a pay phone in the park at the Green Point day-use area. Lakeside Campground on Deer Lake is open for winter camping; no services are provided. BC Senior’s Winter Rate: $11.50 per senior party/night. Read the User Fees Policy for information on Senior Camping Discounts.